The Pentagon is still enforcing DADT. And its excuse for why is terrible. Moments after signing the repeal of Don’t Ask Don’t Tell in December of last year, President Obama looked up to a cheering crowd, smiled, and announced, “This is done.” But last week’s news that the Air Force had discharged an airman in April on the basis of his sexuality indicates that the abhorrent policy lives on. In the face of the resulting media firestorm, the Pentagon quickly released a statement implying that its hands were tied: The airman had voluntarily outed himself, and then asked that his discharge be expedited. Since that statement, the media coverage has mainly faded away and so too has most of the outrage. If the man really wanted to leave the military, the reasoning goes, there’s no cause to get up in arms. But is this really a sufficient excuse? DADT may have been repealed in December, but the process by which the change in policy was designed to go into effect is long and complicated. The newly signed legislation stated that certification of the repeal needed to be approved by the president, the secretary of defense, and the joint chiefs—and none of this could happen until the troops were trained on the new rules, a process set to finish around August of this year. Then, even following such approval, there’s another 60-day waiting period before the repeal finally becomes law. Because of all the time such bureaucratic and logistical wrangling would inevitably take up—and most likely in order to avoid an incident like last week's—Defense Secretary Robert Gates issued a set of new rules designed to make discharge under DADT effectively impossible during the interim. Under the new directive, a servicemember can only be discharged after consultation between the secretary of the relevant service, the Pentagon’s general counsel, and its top personnel chief. As a result, last Thursday’s news that the Air Force had discharged an airman under DADT on April 29—the first and only firing under the gay ban since its repeal—came as a particular shock and sent the Pentagon scrambling to explain the uniqueness of the circumstances. Major Joel Harper, a spokesman for the Air Force, explained the situation this way: “In this instance, the Airman 1st Class made a statement that he was a homosexual. After making the statement but prior to the commander initiating separation action, the Airman wrote the Secretary of the Air Force (SecAF) asking to be separated.” The airman was then informed that coming out before certification of DADT would mean getting discharged, but, according to Harper, he “reaffirmed to the SecAF that he desired his separation action be expeditiously processed.” In other words, the Pentagon was essentially claiming that the airman’s desire to be discharged made this an acceptable application of an unjust law. At one level, the Pentagon has a reasonable point: Allowing someone to use DADT to get out of the military does seem less offensive than kicking someone out against their wishes. But at another level, the Pentagon’s implicit argument doesn’t seem reasonable at all. If it’s discrimination to use DADT to discharge gays involuntarily, then it’s also discrimination to use the law to discharge gays voluntarily. 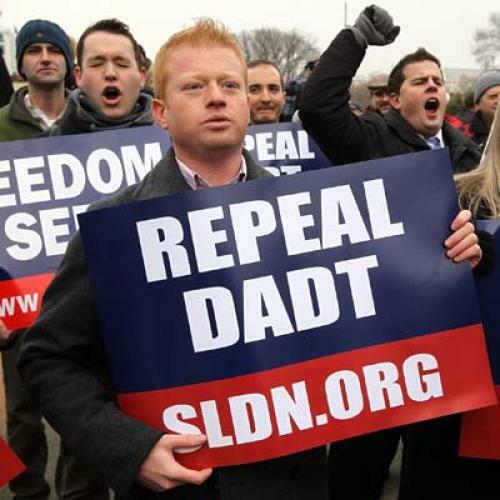 As Jonathan Hopkins, a former United States Army captain discharged under DADT in August 2010, told me, “To kick people out on the rule itself is bad. But to allow other people to subvert their own contract is also bad. It gives people a free pass.” It also treats gays differently from everyone else. And that undermines the entire point of repealing DADT.